Once in the laser suite, you will be positioned comfortably on your back, under the excimer laser. Your surgeon will give you anesthetic eyedrops to numb the surface of your eyes. Your eyelashes will be taped out of the way, and an eyelid speculum will be placed between your eyelids to keep you from blinking. The speculum sometimes causes mild pressure on your eyelids at first, but with the numbing drops, these sensations dissipate. A suction ring is then placed on your eye to hold it in position while the flap is made. Your vision will dim during this step. The surgeon will then use the microkeratome to create the corneal flap. 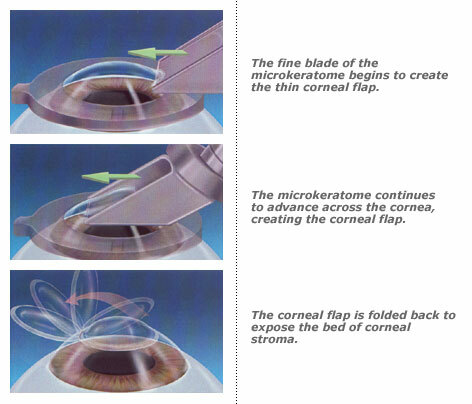 The microkeratome is a precision instrument that automatically peels back the outer layers of cornea, creating a flap that is thinner than a soft contact lens. The extremely thin flap is made from the outermost 25 percent of the cornea. The average cornea, remember, is only about the thickness of a credit card. This flap-making process takes about fifteen seconds. When the microkeratome is making the flap, you may feel slight pressure, and the instrument will block out light as it passes over your pupil. Next, the surgeon will ask you to fix your vision on a target light-usually red, green, or yellow. Then the surgeon will gently lift back the hinged flap. At this point your vision will become blurry. The surgeon will now perform the laser procedure. This usually takes twenty to ninety seconds. You will not feel any pain as the laser sculpts the cornea by vaporizing small amounts of tissue. This process is called photoablation. You will also hear a clicking or buzzing sound with each pulse of the laser. The surgeon is reshaping your cornea. The best lasers today have eye tracking devices that follow your eye during the laser treatment. As mentioned earlier, this provides an extra level of safety. If you move your eye during the treatment, the laser follows your eye. 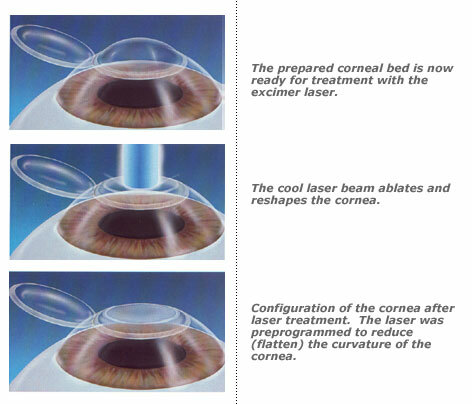 Once the process of reshaping your corneal tissue is complete, the excimer laser will be turned off. Using a sterile saline solution, the surgeon will flush the treated surface of the eye to ensure that any debris is washed away. The surgeon will then carefully replace the corneal flap to its original position. It takes about one to five minutes for the eye to create a natural vacuum to hold down the flap. The cornea has the unique ability to seal itself back in place. The flap adheres like Velcro, so no sutures are necessary. The eyelid speculum will be removed. You will now be able to blink normally. At this point, you will be asked to sit with your eyes closed for about thirty minutes. Then your eyes will be examined one more time to ensure that the corneal flap is properly positioned. 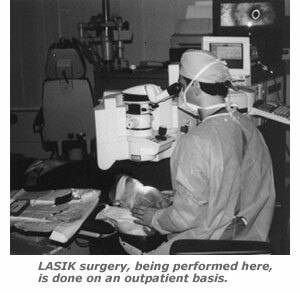 Patients who have undergone LASIK may experience some discomfort, which may last six to eight hours. Patients describe this as a sensation of having sand or a dirty contact lens in their eye. Acetaminophen, aspirin, ibuprofen, or similar over-the-counter pain medications can help. By bedtime the night of surgery, this sensation is usually gone. Immediately after surgery, expect your vision to be somewhat blurred, similar to looking through a glass of water or wearing a dirty contact lens. However, upon awakening later in the day or the next morning, you will experience improved vision. Most patients report dramatic improvement within twenty-four hours. When you are ready to go home, you will receive antibiotic drops, anti-inflammatory drops to promote healing, and lubricating eyedrops, also called "artificial tears." It is common for the eyes to feel somewhat dry after LASIK. You will be sent home with detailed instructions on the use of the various eyedrops. You will wear clear plastic shields or goggles over your eyes for several hours after surgery and while you sleep that night. These eye shields prevent accidental trauma to the corneal flap during the healing period, in case you inadvertently bump your eye while you are sleeping. Your surgeon will probably advise that you go home and take a nap. You may be given a mild sedative to make you sleepy. It is best to have your eyes closed for the first few hours after surgery, and sleep is the easiest way to accomplish this.